Lovely. I’m all for pagan traditions. Local group, Know Your City, sponsoring “Secular Portland Christmas Tour” on the 25th. Sending seasonal positive wishes to you for improved health soon. Thank you for your good wishes, and hoping that you recover quickly and thoroughly to enjoy festivities and to open the new year with joyful anticipation. Frohes Weihnachtsfest, liebe Marja-Leena! And wishing you a rapid recovery. Und ‘n gute Rutsch, as they say hereabouts. Thank you, Naomi, Olga and Rouchswalwe, for all your good wishes! I wish for you to soon glow with health again, dear Marja-Leena. All good wishes – for recovery and for a good New Year. Good health right now and all year long. dear Marja-Leena. And a big thank you to Ellena, Margaret and Natalie, for all the well wishes! Same to each of you! Our very best wishes to you to get well soon and enjoy the season however you most wish! BBC Radio 3, the classical/cultural station, is doing a whole season of ‘Northern Lights’, programmes from and about Nordic countries and their music, there’s some lovely stuff on podcast if you want something nice to listen to while you get better! Most of it’s available for a month. Lucy, thanks for the good wishes and for the link to an interesting sounding BBC program – will check it out! 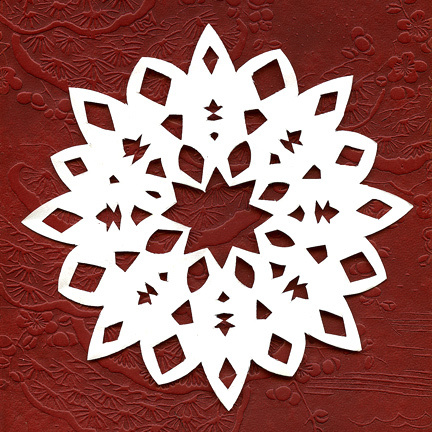 Thank you for the simple and lovely Christmas snowflake. I wish you a happy holiday and much joy in the New Year. Hattie, thank you! And all the best to you and all your family during this holiday season and in the New Year. We are not on your card list, and I’m glad we do not extend that list. Even if we were, no apologies would be required. It’s enough to know you’re still with us. Hope you have a speedy recovery. Tom, more and more on our list are now on email, so much easier! And of course readers like you get the message online. Thank you for being there and for your good wishes. Hope you are recovered; I can’t ever remember you referring before to unwellness. A Vancouver stoic. A year or so ago I was reminded of things you and I have discussed via our blogs when I tried to commission an artist friend to design a cover for my second novel Out Of Arizona. I knew her work, had commissioned other work from her (albeit freer, less specific) and could more or less envisage what I needed. But it didn’t work, despite the fact she has read my novels and has said she enjoyed them. There was no spark. It revived a problem that existed throughout my journalistic career; the difficulties for me, a wordsmith, trying to explain my needs to someone in the mag’s art department whose main reference was images not words. As it happened I did the cover myself and she – ironically but sincerely – commended me for it. A confusion between the role of a patron (who simply dishes out cash) and a co-worker (who has a page which needs a picture – which can’t be any picture). Don’t discount those pagan gods in searching out the way back to wellness. Robbie, I am still under the throes of a very nasty cold/bronchitis and have had to reduce an already planned simple Christmas to even simpler. I’ve mentioned unwellness from time to time over the years but not to great detail for really they are not such serious cases, not even worthy of being called a stoic… though this time I am indeed calling on those pagan gods! That is an interesting story of the challenges of melding words and art by collaborators. Good for you in doing your own cover! I’m made to think of the very successful collaborations on the books by Marly Youmans, illustrated by Clive Hicks-Jenkins. A magical match there! Ah, thank you! And I hope you are now as fit as a fiddle, or maybe two fiddles. Marly, we are both still not quite fit as fiddles but getting there! It’s been the toughest cold/cough we’ve had in many years. I still haven’t had the energy to write late seasonal greetings to anyone, though husband has done a few, as well as managing a few trips for groceries and to the library for books and DVDs. Marja-Leena, I also wish that you start feeling better! It’s of course sheer selfishness from your reader’s side: we want to see and hear from you! Hmm. Which ones of our pagan gods would it be? And: a good tip for bronchitis: zinc and vitamin C. I think it has helped me. Hard to say actually, but I’ve not had any cold fro a long time, and so now I have to go knock on some tree. You know, one of the old Finnish ways to prevent anything bad ever happening! Kiitos, Ripsa! We, that is husband, youngest daughter and I are still sick, though daughter is almost over her cold and a good thing for she’s being doing some of the cooking! Another good thing is that we had not planned to travel to the other daughters homes out of town. Happy holidays to you, Marja-Leena, and I hope you’re feeling better. A happy and healthy New Year to you and yours! Husband and I are still “under the weather” – a tough bug this one! But it can only get better now. Thanks for all the good wishes, Leslee – have a great New Year’s Eve and Year 2016!